Many people underestimate the danger posed by many common household chemicals, especially corrosive items, and end up storing them incorrectly. This is especially dangerous if you have small animals or children around who don’t know any better, and can end up getting into these chemicals, potentially seriously injuring themselves. If you don’t think you have put enough thought into the safe storage of items around your home, below are four corrosive items that should always be stored properly. Bleach is one of the most common household cleaning items people keep around their homes, or in a storage facility, and it is potentially one of the most harmful. 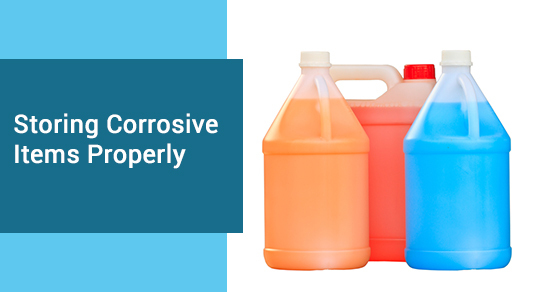 Bleach is a powerful corrosive that can damage the skin, eyes, and respiratory tract. It should be stored at room temperature, in a place that is not easily accessible by children or pets. These household cleaning agents typically contain highly toxic and corrosive substances like ammonium hydroxide (a corrosive which irritates skin, eyes, and the respiratory system). If you regularly clean your upholstery in this way, it might be a good idea to consider keeping these chemicals in a storage facility, away from your family members. We’ve all dealt with clogged drains at some point, and most households keep drain cleaners on hand to deal with clogged drains as they come up. They typically contain lie (a powerful corrosive agent) which can damage internal organs, as well as mucous membranes and the skin. Drain cleaners are often kept right under the sink, within easy reach of children who may mistake them for something else. Keeping your drain cleaners up high on a shelf, and letting young children know how dangerous they are, is always a good idea. These often contain sodium hypochlorite, which is a corrosive agent that can also lead to fluid accumulating in the lungs. These products are easily available off the shelf and many people do not take the proper precautions when storing mold and mildew cleaners. They should always be kept out of reach of young children, and clearly marked, so that anyone using the storage area knows what the chemicals are. Storing corrosives in an offsite location such as a self storage facility might be your best option if you have power chemicals around your home (whether for work, or for personal cleaning) and you are worried that pets or small children are at risk. Keep in mind the above common corrosives and their specific storage needs, and ensure you are doing everything you can to avoid accidents.